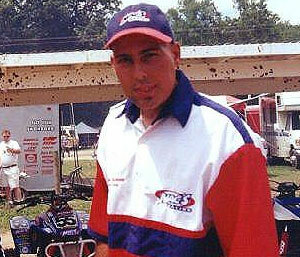 Darren Naccarato has committed his life to ATV racing. Ten years ago many people laughed at him for putting his time and money into a sport that didn’t seem to be going anywhere. In the late ’80s his strong will and determination drove him to form Nac’s Racing. The former pro racer has now made the company an enormous success. Nac’s provides racers and recreational riders all over the world with quality products and services. Now Darren is using that same strong will and determination to battle the bone cancer (ewins-sarocoma), he was diagnosed with in 1995. This sickness would probably slow the average person down, but Darren Naccarato isn’t your average person. ATV Scene: Welcome back, Darren. We heard you went to the first AMA Supercross in L.A.
Darren: Oh yeah, it was cool. I saw all kinds of people I knew. I had full- access pit passes, I got to tour all the factory semis, and I got the royal treatment at the hospitality tent at the FMF semi. So, I was definitely mingling with the big dogs. Actually it wasn’t all fun and games, though. I was in Seattle for a meeting regarding treatment programs. ATV Scene: How’s everything going with your cancer treatments? Darren: Well, it’s going okay, but it’s far from over. It’s a battle that I’m going to have to deal with for quite some time. It will either get real good or real bad. The plan is two stem cell trance plants, one following the other. Each is the equivalent of a bone marrow transplant. ATV Scene: What is an average day for you? We hear you are always tremendously busy. Do you go in for treatments everyday? Darren: Well, some days I’m not in the hospital at all , but some weeks I’m there the whole week. Currently with my treatments, I’m not at the office much, but when I come in it’s usually a 10- to 12-hour day. I spend a lot of time on the phone. It is non stop! I usually bring work home with me also. I’ll be spending a lot of time in Seattle for treatments, I’ll be there for 6 months. ATV Scene: You’re in all our prayers. We’re behind you 100%. Darren: Thank you. I keep plugging away. That’s all I can do. Hey this whole Internet operation that you guys have going on…I’ve been checking it out and it’s really cool! I’ve been telling a lot of people about it in the industry. I think it’s good exposure. I really want to get involved. I think it’s great all the things you and George Davis [the ATV Connection’s Racing Editor] are doing, and that goes for the National you are promoting in Deerfield, Ohio too. I hear there are going to be some ATV racing firsts at that race. ATV Scene: How did you get into ATV racing, and how long ago? Darren: I started in ’85. I’ve just always been an enthusiast. I raced amateur until ’87, then pro until 1995. ATV Scene: What was your favorite track? Darren: Dallas Ricker TT, in Tennessee. It was on, and in the infield, of a huge mile auto track. I always liked a big fast track, and that one had a nice layout. ATV Scene: How did the Nac’s merger happen with FMF? We hear you handle all of the quad stuff for them. Darren: I’ve had a long-time relationship with the guys at FMF. When we put the whole team together with Doug Gust, we were looking to see who would like to get involved at the level that we needed. FMF knew the numbers were good in the ATV industry, but didn’t have anything much going on in the racing part of it. They wanted to go out and display what they had to offer. So we got the whole thing together and it was a little involved, but everything worked out real well. ATV Scene: What’s the team doing for the 1998 racing season? Darren: Here is how we structure our sponsorship. We have our support riders, who usually have their own program. We have upwards of 200 riders in that. Then we have an in-house program where we have total control over the entire program from head to toe. These riders include Doug Gust, Sean Sermini, who will run in the A class for us, and Joe Sircansano, who is a local who is going to run the 4-stroke B class. His father owns a Dodge dealership and they’re going to supply a rig to haul one of our race trailers. We’re going to try to bring him up through the ranks. We are heavily supporting the B classes because I feel that’s were it all begins. ATV Scene: What are the responsibilities of your in-house guys? Darren: They’re out there to develop, test new products for us, do photo shoots for articles, and that kind a thing. They do more then just run our decals. ATV Scene: Anything new for Doug Gust’s bikes? Darren: As far as the MX goes, we aren’t changing much. Last year, Doug won a moto at every event, so we were pretty successful in that respect. We just had some bad luck. Unfortunately, we ended up with only two overall wins because of that. We are doing a few things to make it a better program, but just minor changes. However, in the TT program, Doug will be on a new bike. We will be building something entirely new for that. ATV Scene: Do you do all the actual porting and modifications, or is that all FMF’s responsibility? Darren: It’s all done by FMF’s Terry Varner himself. He does all of Nac’s cylinders. FMF has several guys that do motors, but if a customer goes through Nac’s, Terry handles it himself. ATV Scene: Terry Varner used to race himself, right? Darren: No, but he sponsored Gary Denton way back when he was on Suzuki Quad Racers in ’85 and ’86. He was one of the biggest engine builders in ATV racing back then and now he’s back stronger than ever. So it’s pretty cool. ATV Scene: Who do you think will be a threat this year? Do you see any up-and-comers that might surprise people? Possibly Keith Little? ATV Scene: Nac’s Racing has contributed big bucks to this sport. Do you see something huge coming in the future? Darren: Unfortunately, I don’t see anything huge coming in the near future. I think at this point we all should be content if things just keep progressing as they have been. Nac’s is involved in racing because we have been around for so long-and for the love of it. I guess it’s to show appreciation-for the fact that we have been supported so well by all of our customers-that makes us more willing to give something back. This coming season will be our tenth year in business, so we will be doing a few things to celebrate our tenth anniversary. We feel that it’s an accomplishment. A lot of aftermarket companies have come and gone, so we have some things planned with our team sponsors that should make for a real special year. Nac’s and FMF have a good relationship. They’re a super operation. Together we can do even more. ATV Scene: Do you think ATV racing could ever be as big as MX racing? Darren: I wouldn’t say never, but it will be a long road. Look at how long motorcycles have been around. It didn’t grow as big as it is overnight. ATVs are still young in comparison. ATV Scene: At the Ashtabula National, you put up the protest money to check displacement and fuel for the top-two finishers in the 250 Pro class, which caused quite a bit of controversy since both Hitt [first place] and Farr [second] were Nac’s support riders, Why the protest? Darren: Well, my whole theory is this: We’re under the rules of the AMA, and in the pro class we are just that-professionals. Pro-level riders are trying to make a living by racing through sponsor support. It requires a fairly large amount of money and talent to go racing. I know our effort with Doug is huge. The AMA should be involved, making sure that everyone is playing by the rules. In other forms of racing you see this, especially in forms that are considered to be bigger than ATV racing. One of the easiest ways to bring our sport up to that level is to adopt the normal practices of these other types of racing, whether it be NASCAR , AMA motocross or what have you. It simply lets everyone know that we’re serious. It brings it to a higher level of professionalism. I wasn’t looking for controversy, by any means. There shouldn’t have been any controversy. I simply went to the AMA referee before the race and said I don’t care who finishes in the top ten. It’s about time we started checking these guys out. ATV Scene: All season long there hadn’t been one tear down. Ashtabula was round seven of the ten-race series. You make a good point. Darren: Right, so the referee at that point, prior to the race, said, “No, we will not do that.” I said, “You’d better impound the bikes, because I think there may be a protest following the event.” Now, in between that point and the end of the race, Terry Varner and I discussed putting up the money for the tear down on the top finishers since the AMA wouldn’t do it. FMF is used to dealing with racing on a much higher level of professionalism than ATV racing, being that they are so involved with the MX bike scene. They have spent a lot of money, and they have two semis going to bike and ATV races this year. They feel that everyone should play by the rules. Terry simply felt it was important, and I agreed with him. That’s why it happened. ATV Scene: So, if anyone thought it was something personal, they were entirely mistaken? Darren: Exactly. In my opinion, being torn down is a compliment. I would be honored if someone tore us down. That would just be saying that our stuff runs so good, that they’re curious to see what’s in there. So I wouldn’t take that personally. I would be happy. Of course, if you’re not cheating, you walk away with the protest money, too. If someone has a problem with getting torn down, maybe they’re guilty of wrongdoing. Unfortunately, since we would have had to start writing checks to do the entire top ten, we opted to protest the top two. They happened to also be the two guys who were battling for the points lead with Doug Gust. So, wouldn’t that be the smart thing to do? We honestly didn’t think anything would be found illegal with either bike. It cost $100 to protest each rider, and I would have bet $500 that both Hitt and Farr were totally legal! We just wanted everyone to know that we had the nuts to protest, like we said we would before the race. Darren: Thanks for the interview! I would also like to thank the 98′ sponsors that make up our team effort: FMF, Laeger’s, PEP, Hinson Racing, Klotz, Thor, AC Racing, Dura Blue, Douglas Wheel, Braking, Pro Design, Maier Mfg., Bell Helmets Throttle Jockey, Outerwears, Motion Pro, ITP Tires and Dragon Custom Graphics.